It’s 2040, and the Inner Long Island Sound has been transformed from one of New York City’s worst polluted areas into a healthy place to live and work. From the Whitestone Bridge to the Triboro Bridge, the waterfront is finally open and accessible, with protections against sea-level rise and storm surges. An urban park ranger gives a tour on the newly opened North Brother Island, explaining how pollution was reduced; wildlife restored to the water, land, and air; and asthma and other respiratory illnesses in the nearby neighborhoods virtually eliminated. A Bronx woman takes the new Triboro line to her good-paying industrial job, a 45-minute commute reduced to ten. On Rikers Island, the notorious detention center, now provides jobs instead of jails, with state-of-the-art energy generation, education, and environmental facilities. For decades, the Inner Sound area was one of the most inequitably treated places in the region, with multiple wastewater-treatment facilities, power plants, jails, noxious industries, combined sewer overflow, and waste-transfer stations. Pollution was commonplace in the surrounding mostly low-income communities, with subsequent health problems. 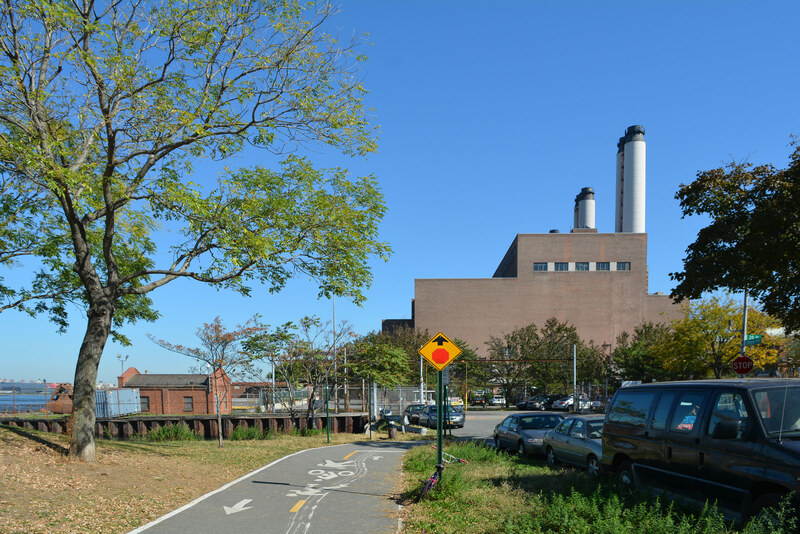 Asthma rates in Mott Haven were the worst in the city, and children in Hunts Point were more likely to live within walking distance of a waste-transfer station than a park. Along the seven miles of South Bronx shore, the inaccessible industrial waterfront contained only two small parks totaling less than 1,000 feet of shoreline. On the North Shore of Queens, there were nearly nine miles of inaccessible industrial and airport waterfront from Astoria to East Elmhurst. 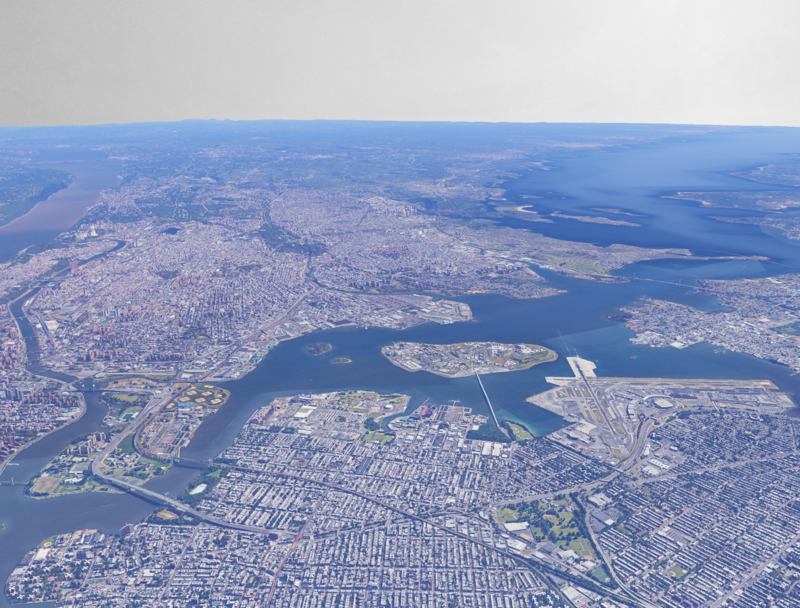 At the center of this was the 413-acre Rikers Island, a violence-prone and isolated jail where 79 percent of those incarcerated were never convicted of a crime and were simply unable to make bail. Yet the Inner Sound also was home to badly needed blue-collar jobs and protected islands. Instead of eliminating them, the city found ways to integrate the natural amenities with industry and residents in an environmentally friendly way. Much of the transformed area was owned by the city, including all of the islands in the harbor (Rikers Island, North and South Brother islands, and Randall’s Island), four waste-treatment plants, the Hunts Point Cooperative Market, and several other large parcels of land. Utility companies and other quasi-public entities owned other large parcels of land. This provided an opportunity for implementation of a comprehensive vision for the entire area. The first step was closing the Rikers Island jail complex and transitioning to smaller borough-based jails, as recommended [eb10] by The Independent Commission on New York City Criminal Justice and Incarceration Reform, and supported by the City Council and Mayor de Blasio. This approach not only reduced incarceration rates throughout the city but also opened up Rikers for industrial, educational, and recreational uses. 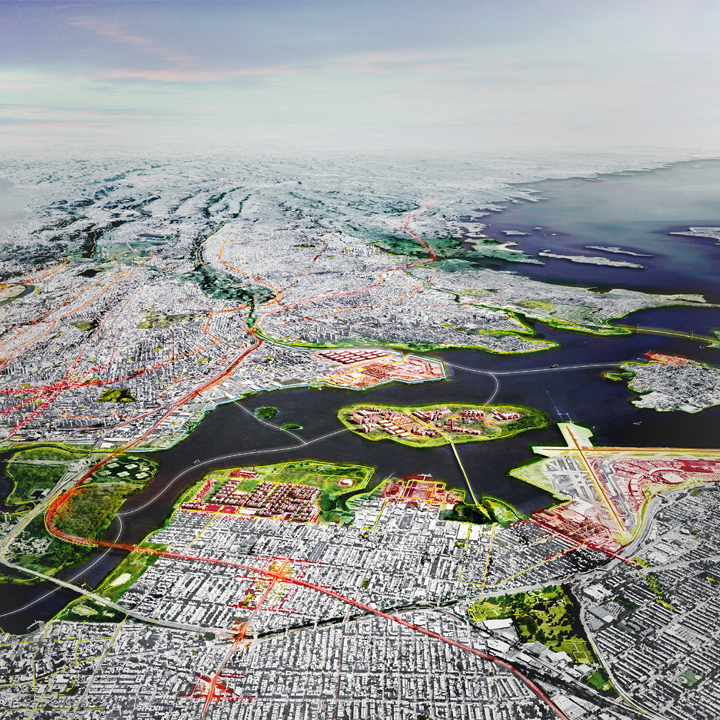 These include a composting center, wastewater-treatment plant, waste-to-energy facility, related education and job training facilities, a public greenway, and a memorial to Rikers’s notorious past. As a result, wastewater-treatment plants and truck-to-truck waste-transfer facilities were eliminated in the surrounding neighborhoods, reducing air and water pollution and allowing the creation of clean industry along the waterfront. A new Triboro rail line provided a new transportation link for Northern Queens and the South Bronx, including access to open space on Randall’s Island. 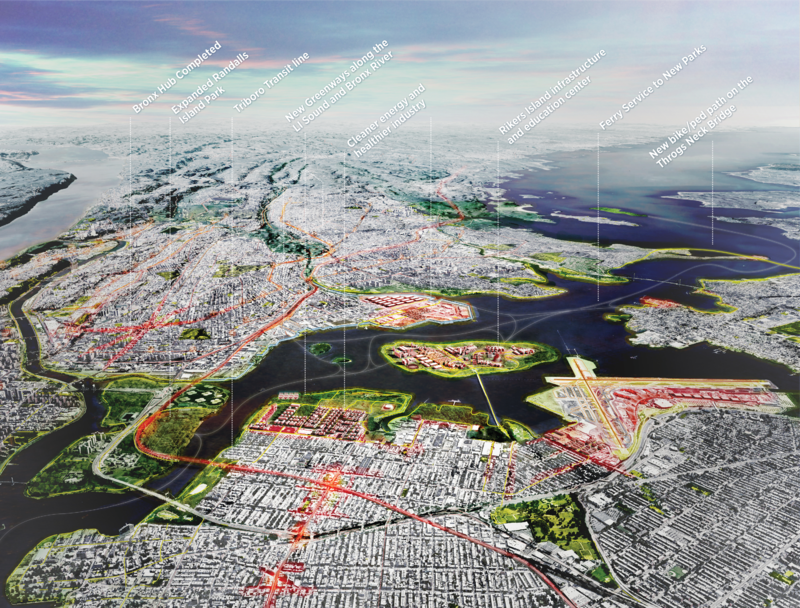 The future of the Inner Sound was determined to a large extent through a comprehensive community planning process, which included neighborhood residents, community groups, public agencies, and large local employers and institutions like Con Edison and the Hunts Point Food Co-op. This built on previous, smaller planning efforts in these neighborhoods. New parks and recreation areas could be developed quickly, because much of the unused or lightly used land in the area was already owned by the city, utilities, or public agencies. As more land gradually became available through decommissioning, the plan was further refined and implemented. And as technology improved, new energy-efficient and environmentally friendly industrial facilities—including power generation, wastewater transfer, and food delivery—were added, improving the health of surrounding communities as well. 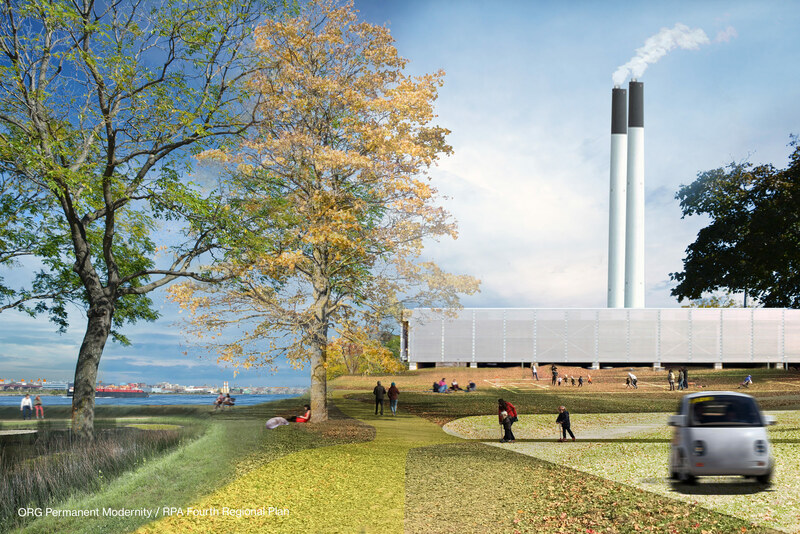 Building a new waste treatment station on Rikers Island and eliminating combined sewer overflows drastically reduced pollution, restored natural environments, and improved health. Opening access to the waterfront, creating more parks, and reducing truck traffic and noxious uses in residential neighborhoods helped address environmental and social injustices of the past. Preserving industrial land and brought more good-paying jobs, and a new transit option in the Triboro line has enable more access to them. It has also provided a national model for other cities throughout the country, illustrating how technology can allow modern infrastructure and recreation to co-exist on the waterfront.